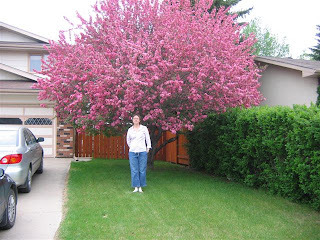 I actually was quite excited about this beautiful flowering plum tree in our front yard. It's exciting for us to be in a more developed yard, I am enjoying the squirrels and birds who also share our yard. However, we have considerable work to do, removing an overgrown elm tree, lifting up the deck, etc....etc.. Right now the major project is the driveway which does NOT look like the photo above...... it has been completely removed and the entire thing is being redone. Thanks to my dad (Jim Condon) he has lined up reliable contractors and is the chief superintendent of the project. If not for my dad we'd probably be living with the crappy temporary stuff for longer than we should, so we are VERY grateful. Our house will look stunning with it's new concrete! Michelle was home this weekend and we had a quiet and lovely time. For me, same old, same old.... 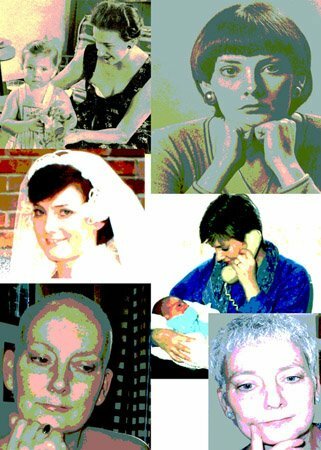 Round 6 of Xeloda, the side effects do accumulate so I have more challenges than before. I also have a nasty cough which either lingers from my viral infection, or is the cancer raising it's ugly head again. I honestly cannot tell which it is, but my functional ability is quite limited at the moment. However, as I may have mentioned, I live a life filled with love, and I have many loving family and friends who make it possible for me to enjoy every day as normally as possible. It makes me realize just how lucky I am, although I realize that is going to sound like a ridiculous idea, given my overall circumstances, but it is honestly what I feel. thanks for your post. Sorry to hear about the side effects and the cough. I am looking forward to visiting in Montreal. I had a nice visit with Craig, Michelle and Adam last night here in Winnipeg. We went to the Asian restaurant looking over the baseball field at the forks. It was quite good. I am in the airport waiting for my flight at the moment and thought you would be interested in knowing that I was in the bookstore, saw "Stanley Park" and given how many times you have recommended it to me, said to myself..."I better buy that before I see Jo in Montreal". So it is in my bag and I will start it on the plane. HI Joanne, What a lovely tree!!! I am so sorry to hear that you are accumulating more side effects and that the cough has not gone away. I hope that you are able to enjoy Montreal with all of your family. I am looking very forward to seeing you next Friday and having lunch at Zest. If lunch out doesn't work than we will have lunch in!!! Take care and I hope that you can feel a BIG HUG. The tree is lovely as as you my dear friend. You must be almost 4 weeks behind balmy Scotland -although it has rained for two straight days here. I'm sorry about the cough. I'm glad you are surrounded by love, you deserve to be. And it extends all the way to this side of the pond. That tree must be quite old - to be so large. It's pretty and it probably smells wonderful too, heh. Sorry about the side effects, but hopefully that powerful drug is doing it's job. We look foward to seeing you in Montreal. "A divine influence upon human beings..." How perfectly fitting..